Have you ever experienced shell shock? That feeling of surprise as you survey the copious amount of shells that are left behind by your birds. It's a common occurrence, but it doesn't have to be. That's because tidy dining solutions are one of our specialties. 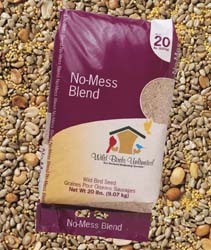 Sure, we still have our No-Mess LM, No Mess Plus, No Mess NM CD Blends, featuring seeds and nuts without their shells, but we now offer more tidy dining options than ever before. • Peanuts – the best single source of protein and fat, peanuts attract most birds. WBU Split Peanuts. • Suet – high in fat and energy, suet is always a tidy dining option. 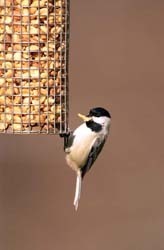 • WBU Bird Food Cylinders – long lasting and easy to use, Bird Food Cylinders allow you to refill your feeders less often. "Nutty for Nuts" and "No Mess" Seed Cylinders. • Jim’s Birdacious® Bark Butter® - a spreadable suet that has attracted more than 140 different bird species. • Mealworms – a tidy, protein-rich food for attracting common and uncommon birds. Now, also freeze-dried mealworms made in the USA! Ours are not made in China! • Nectar – hummingbirds’ favorite. Just keep it fresh, and there’s no mess! Ask us about Nectar Defender! The best thing ever for your homemade nectar! Offering the right food doesn’t always solve the problem. Sometimes, you need some additional help. We offer a large selection of trays that catch most of the shells and keep your feeding station nice and tidy. Better yet, try our blends with no shells! Why pay for shells? Tidy dining allows you to spend more time watching your birds and less time cleaning up after them. Visit us soon, and we’ll help you find a tiding dining solution that is good for your birds and great for avoiding any unnecessary shell shock.